Dr. Brian Cox currently hosts "Wonders of the Universe" on BBC. Every Friday, Light Years will bring you "5 Questions" with a newsmaker, author or influencer in the space and science worlds. 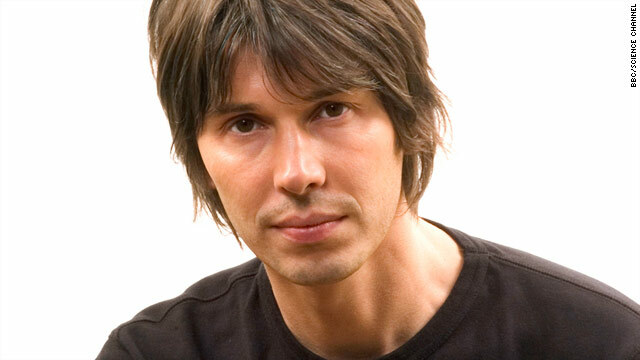 Rock star-turned-physicist Brian Cox, at 43 years old, has quite the impressive resume. This British particle physicist left rock ’n’ roll in the early '90s to pursue his first and true love: science. Dr. Cox is the host of the BBC program “Wonders of the Universe,” which debuted in the U.S. this week, and is the author of the recently released book by the same name. Cox is a Royal Society University Research Fellow at the University of Manchester. In addition, he is working on the ATLAS Experiment at the Large Hadron Collider at CERN in Switzerland. You went from playing the keyboard in a British rock band to teaching science. How did that transition take place? I’d always been interested in astronomy and space exploration. My dad tells me that I watched Apollo 8 go around the moon back in 1968, when I was only a baby, so I’ve always been interested in science. Being a musician came a bit later. When I was 14 or 15, I got into music and took a little detour and then went back to the university. Being a musician was fun. I traveled out of the UK just once, going to LA when I was 19 to make an album. But to be honest, I think I got out of it at the right time. I wouldn’t want to be doing it now. I love being a physicist. Before doing a TV program and writing books, I was just doing research in labs in Germany and Switzerland, and that’s what I love doing. I accidentally stumbled on this new career of making TV programs, but that’s been quite fun as well. Are there planets in our universe, besides Earth, that can sustain life? Technically, we don’t know. We know that on Earth, where you find liquid water, you find life. Mars is getting more and more interesting every month. The evidence is that there’s probably liquid water there, but it hasn’t been proven yet. Another one is Europa, one of Jupiter’s moons. It has a saltwater ocean beneath the surface. That’s real tempting — what you better do is go and find out. Do you believe the human population will be living on those planets anytime soon? At some point, yes I do. I would be very disappointed if I didn’t see us land on Mars within my lifetime. We should be there already — we know how to do it. We already live in space. The space station’s been there for over a decade. There should be a base on the moon, too. I guess it’s up to the ambition of the human race. You think we’ll be forced to leave Earth one day? Earth has a finite amount of resources. The chance of a species getting wiped out from an impact of something from space is quite high. We will get hit by something big. We need to know how to live and work in space in order to protect our planet. As [legendary American astrophysicist] Carl Sagan once said, “If the dinosaurs had a space program, they’d still be around.” I don’t understand why we’re limiting ourselves to Earth. There’s lots of room, lots of resources out there — it seems inconceivable that we wouldn’t explore it. When do you believe the universe will end? I think at the moment that it will last forever, but that doesn’t mean we can last forever in it. All structures end up decaying away — at some point, there will be no stars or planets. Even the black holes will be gone. Right now, when stars die, the gas and dust from them goes out to create new stars. As the universe expands and thins out, that process slows down and there will be no new stars born. If it expands forever, it will eventually disintegrate into radiation. We’re talking trillions of years in the future, but at that point, all the stars will run out of fuel, so it will kind of end in a way. Woah this blog is fantastic i really like reading your posts. Keep up the great paintings! You understand, many individuals are looking round for this information, you can help them greatly. I'm going to live on the trojan asteroid floating around our orbit. There will be a lottery for the three remaining seats on my rocket. The only catch is, I will be your Overlord. When you say the global warming switch cannot be turned back off, are you saying because you think people won't change their ways, or is the physical damage already done and incapable of being fixed? Also, to be honest, I don't see how over-population is the ultimate issue here. How are you connecting that to global-warming and space exploration? Chaalz, I am saying that more and more scientists are now saying that the global warming is irreversible. In other words, even if we change our ways, it won't stop it. I tend to agree, but hope otherwise. Essentially, it is far worse than we thought but we just don't know the true magnitude of the problem. My point about tying it to outer space exploration was a response to the comment that space exploration can eventually save us from disaster. I think space exploration has important benefits to us in many ways, but the problem is that it just doesn't solve the over-population issue. And over-population is the underlying, indirect cause of global warming which in turn is resulting in a mass extinction of species that is occurring right now. And, as shown by the recent dinosaur studies, we need biodiversity to survive as a species. Essentially, the world can absorb a certain level of our waste, but not the levels that come from a population that exists now. A few power plants, a few cars, a few cows in the fields, and this is ok, but that is not what we have. We dominate the planet. By doing so, we will end our existence. I don't see an out. Not new technologies, not space exploration. Only a huge social change in our reproductive rate. But, the religions of the world are too ingrained in peoples' minds, and too many encourage making babies. And even without religion, the process of making babies is the only real justification in people's minds for their own existence. I wish the social knowledge of the masses matched the technological knowledge that some of us have, but that just isn't the case, and sadly, won't be. I know I paint a dark picture here, but I must face the truth, and it is bleak indeed. I wish others would too. The human race has screwed up this planet, so let's go somewhere else and mess that up too? Human "space" exploration is hugely expensive. Maybe the Chinese will do it eventually, we in the US and Europe are done. The orbit of the International Space Station is less than 300 miles above the surface of the earth. That's less that 1/2 inch above the surface of a 12 inch globe in scale. That's outer space? Exactly, bwb41. In fact, even if there is a place in the entire universe that has exactly the proper requirements to support our species, the problem is that such a place is likely millions of light-years away. No space vehicle would be able to sustain life for the time necessary to travel that distance, and we likely will never be able to detect such a place anyway. The most we can do is detect if a planet is "somewhat" like ours, meaning whether it has an atmosphere or similar in size, but not much else. We cannot embark on such expeditions on a long-shot. Just curious - are you a college-educated physicist or biologist? I am (zoologist, although I make my living in IT), and I find your comment unintelligent and uninformed. Just because someone is able to espouse their views and opinions through modern media doesn't make them a "TV physicist". People like Dr. Cox try to educate people, but only those wishing to be educated will listen with an open mind. I thought this article was going to be about Brian May from Queen. One of the problems I have with Dr. Cox's remarks is the suggestion that we will need to explore other planets to survive. While it may be that we will be able to make the transportation of raw materials from other planets to earth feasible (although I doubt it if on a grand scale), we should face the fact that our bodies are built for very precise ratios of certain chemicals in the atmosphere and certain precise amounts of gravitation necessary for our bodies to function and develop properly. In addtion, there is the HUGE problem of radiation which may make any attempt just to reach Mars impossible. No, our home is earth, and always will be. I loved Star Trek, but it is a fantasy, not science fiction. I believe his comments about space exploration are pretty accurate. Man will eventually have to explore other planets in order to maintain and secure our survival. Your reaction is primarily based on fear of the unknown and inability to realize that this planet will not be able to house every human being, especially at the rate the population is growing. Another reason for the exploration of other earth like planets is due to the fact that this earth will not last forever. What happens if one day we discover an asteroid is on a path to collide with the earth and it would be able to destroy all life if it struck? What do we do then, pray the asteroid away? Space exploration and the search for other earth like planets is an imperative human mandate. I do not have such a fear of the unknown, HST. As for my lack of any realization of human overpopulation, I ask you to read my comments below. Regarding your own thoughts on the importance of space exploration, at one time I agreed with you, but no longer. It is true that we MIGHT be able to stop an asteroid, but that is proabably more for the movies than reality. I agree it is worth investigating, however. It WILL happen again with devastating results. But, we will all likely be gone by then for other reasons. Space exploration is wondrous and exciting. But it won't save our planet. Sorry for the bad news. "we should face the fact that our bodies are built for very precise ratios of certain chemicals in the atmosphere and certain precise amounts of gravitation necessary for our bodies to function and develop properly"
Seeing as the only humans you have seen are those who were conceived and born in Earth's atmosphere, you have no basis to assume anything about how the human body would adapt if conceived and born lets say on Mars. Have an open mind. Space exploration isn't about saving our planet, its about finding new places to spread out to, to give our species the best chance we can at surviving. Researchers already have some idea of the problems of development with different gravities, Chaalz. It isn't a trivial issue. Sure, let's keep our minds open to new ideas, but let's not get too optimistic about our technical abilities. As I pointed out in one of my responses above, there is, ultimately, the problem of the vastness of space. It is an insurmountable problem. And I truly mean it is an impossible problem to solve, contrary to the fantasy geeks who want to push "time warp" or any sort of deep hibernation. You can say this is "narrow minded" thinking, or "negative thinking", but the beauty of science - and the very purpose of it - is to understand the nature and limitations of the world around us. And "limitations" means just that: limitations. That which can't be done no matter what. Any other type of thinking is just fantasy. Sometimes just understanding those limits is exciting in itself. He's got a good show and I honestly like the guy from what little I know of him, but he's got the 2nd most annoying voice on TV, right behind "Mack" from Future Weapons. Huh? Rock Star? I've never heard of Brian Cox. How is it his fail that you've never heard of him? He has spoken in dozens of venues and is well known in the physics community. And don't blame him because CNN calls him a rock star. He never said he was. When I first saw (partically obscured) "Dr. Brian," I was thinking it was Brian May from Queen. He went on to become quite an astronomer. I figured that could be considered a physicist of sorts. CNN's an American organization and the commentors are overwhelmingly American. Foreign culture (including 'rock stars') doesn't get much respect here. Another famous rocker/astrophysicist is Brian May from "Queen", composer of "We will rock you". Most musicians are very intelligent and creative. Most? I do not think most have the capacity for serious academic work. But some definitely do. And some academics could have been musicians, too. I was a professional musician for a few years before I went back for my Ph.D. Of course, my fame (in both fields) is nowhere near Cox's - but fame shouldn't be the goal. Passion should, whether for music, art, science, baseball, or even just life in general. You could say that many scientists are intelligent and creative. His science documentaries are some of the best I've ever seen, and I've been around long enough to remember the "glory days" of un-dumbed down, pre-1980 nature shows. "Wonder" has great writing, great photography, and great graphics. And while the shows never drag, they're not geared toward those with a picosecond attention span. Wow. This guy has managed to scientifically morph himself into a very pleasing combination of three not so pleasant rock 'n roll faces: Ric Ocasek, Rick Springfield, and Steven Tyler. Nice! Uh, D;ream? What the hell kind of band is that? Certainly not one of 'ROCK STAR' status. He can't claim that he was a "rock star" if the band isn't even acknowledged or recognized in majority of the free world! This is a perfect case of "Quit your Day Job! because being an actual scientist is better than "D;ream-ing of being one! He didn't claim he was a rock star. That's CNN saying it. Brian Cox, however, is a very entertaining speaker on astro-physics. He's one of the few scientists who can speak to a crowd and keep them entertained and interested. He was pretty big in the UK as part of 'D:ream' and 'Dare'. 'D:ream' had a whole bunch of hits and both of their albums hit the top 5. Granted, they never really hit the big time across the pond. They had a hit that I remember hearing on the radio here in Canada a time or two. I think it was called "Things Can Only Get Better" or something like that. They weren't my favorite band, but they had a lot of success. As for 'Dare', they're a hard rock band with one of the guys from Thin Lizzy, but I didn't really like them. They're pretty popular though as far as hard rock bands go. His program on the Science Channel is great. I encourage everyone to give it a look. No doubt, by the implied definition of *rock star* here I'm bigger than David Lee Roth (who?). I think there is a difference between having been in a band and being a rock star. For instance, you know, being a star. Although, on the other hand, then the headline wouldn't have sounded as good. I respect but do not share Dr. Cox's optimism. The evidence is that civilization has risen and fallen several times already. The Egyptians, the Babylonians, the Indus valley people, and the Mayans all had advanced mathematics including some knowledge of astronomy. The Greeks, the Romans, the Celts... all great civilizations have fallen to dark ages. My personal theory is that the advancement itself contributed to the decline. People get so smart and ahead of themselves, they forget to live sustainably. We are making the same general mistake today, and this culture will also fail catastrophically. Sorry but that's the news. Reggie, I agree with your general premise but not the details. Older civilizations such as the Babylonians and Mayans (among many others) were localized for the most part. Granted that many wandered/conquered beyond their natural geographic boundaries, but humans are now a global civilizations. This is not to say that regional peoples/cultures won't "die out". Just look at what has been happening in Africa for the last 100 years: Countries crumbling, populations being wiped out by famine and war. And I'm strictly speaking about humans - don't get me started about animal species. I almost wonder if my granddaughter (who is 9) will be able to eat a fresh fish caught out of the ocean when she is my age (57). They might not be there in sufficient populations in 50 years to supply a food source. Joel, you are right, but Reggie is also right about people "getting ahead of themselves." Essentiall, we have been able to advance technologically enough to offset our dwindling resources from our exploding population. The problem now is that it appears that the technological benefits for the extension of basic resources (like improvements in agriculture), are now following the law of diminishing returns. We have advanced so much, and yet we cannot control that basic desire to procreate. Our technological advances have gotten ahead of our social abilities to collectively control our human desires. In essense, we ARE doomed, and we are now finally beginning to see the effects in the destruction of our planet due to overpopulation in ways we never have seen them before. We have pretty much filled up our petri dish. I'm with you. There are many, many aspects to the situation, which could be discussed and debated forever. We have, while certainly not a dead end, reached a major speed bump with the "technology-assist" for humanity. You can only get so many grains of rice out of a paddy, and only so many kernels of corn out of an ear. As long as we procreate (one of the primary, if not the strongest, human instincts) and outstrip the ability of this planet to provide the resources to sustain the population - we are all in for a rude surprise. I feel for my grandchildren - i think I'll be long gone before it really hits hard. Yes, Joel, I have read that archaeologists have found some evidence of "super-species" in the past that managed to wipe-out the species directly below them in the food chain, which in turn, wiped out all species below them more than once in our planet's history. Whether we do it by the destruction of other species (such as by global warming) or just by eating ourselves out of existence is to be seen. But, I too feel for the grandchildren. I think they will really start to see it all in a big way. it is so sad, really. This is the kind of conversation I always hope to find on these forums. Too bad that most here are more concerned with the fact that Brian Cox used to be in a band. Joel, it is sad indeed when a discussion of whether Cox is a rock star or not rates a bigger response than what he actually said, isn't it? Following your other comment, you mentioned the destruction of other species. I have been finding that the destruction of other species may be far serious than we have even thought. It has recently been pointed out that the dinosaurs were actually in serious decline about 5 million years before the Big Asteroid put the finishing touches to them. It appears that it was quite likely due to a general reduction of biodiversity that had been occurring which somehow was slowly causing the extinction of dinosaur species. Whatever the reason, we may be dooming ourselves just from that reduction of species that we are causing in the world around us, for which the impact may still be unknown, but are very real. And this alone may occur just from global warming, for which some are suspecting itself may be irreversible. You haven't noticed the trillions of dollars invested worldwide to create renewable fuels and power? We are all aware genius, do have the solution? We're working on it, making progress and are on the right track. Even though our civilization has many major issues including natural disasters, disgusting & rampant religious wars, etc., we still, as a whole, advance. I just read last week that the Mars Rover (one of the two) is still driving around Mars and sending back photos and other data. Positive thinking brings positive results. It takes many generations to cause worldwide improvement, as one generation improves the planet; the next generation begins from there, perpetually. Although our advancement has created a byproduct, called running out of resources, look what has come from the use of these resources? The power that we harness because of their development has advanced our civilization, enabling the resources and technology to attempt the destruction of any imminent threats the planet faces. It’s not as if we should not use the resources so we don’t run out, use all of the resources necessary to develop sufficient renewable resources for the generations to come. That is the Holy Grail and what our civilization is clearly seeking and making some headway. It is all too little, too late, Rdwhtnblu. Sorry. That doesn't mean that we should stop searching for more technological solutions to delay the inevitable. But we would probably need a population of about 1/1000th (!) of what it is now to enable our species to last until the time the sun finally gives out. And sadly, that isn't going to happen based on the general education of the people on our planet. Do we know how many of them recognized this at the time and tried to do something about it? We seem to recognize our ability to wipe ourselves out, so does this recognition mean we can survive? Is the propensity for a civilization's self-destruction proportional to its technological advances, meaning that all civilizations will eventually wipe themselves out no matter how advanced they are? Or, on a more positive note, have we now reached some critical mass technologically speaking, that will effectively allow our civilization to "self-correct" and keep our species alive? Chaalz, you directed your question to Reggie, but I cannot help but respond as well. You asked several interesting questions, but ultimately, the question is whether we can control our overpopulation. We don't have the social tools to solve that. China made a big effort with a one-baby rule, but has failed. And, our technology, in spite of short-term benefits, has serious ecological long-term disastrous effects that appear now to be out-of-control. We are wiping out other species faster than new ones are created. And, with global-warming, we have turned on a switch that more and more scientists appear to recognize can't be switched back again. We have a truly disastrous scenario starting to visibly play out in our lifetimes for which we may be able to prolong the inevitable, but which is something that is beyond our control. Think about it: how do we convince most of the people in the world to have NO babies? How do you do that? And yet, that is what must be done. Sad, isn't it? did they have spaceships? no? then STFU! Misleading title just to get someone to read. Hey, wait a minute! With all due respect, I never heard of this guy as a rock star. And then there's Brian May, guitarist for Queen (as in Freddy Mercury, Bohemian Rhapsody, etc.!) who holds a PhD in Astrophysics! I hope my face looks that youthful when I'm 43. I like Brian Cox, and I find his TV program interesting, but having ever played in a rock band hardly qualifies you as a "Rock Star." By that definition, I'm a rock star. So, where are my residual checks?